Manufactured in France to Charvet’s exacting specifications, the Charvet Salamander is flexible, powerful and robust. 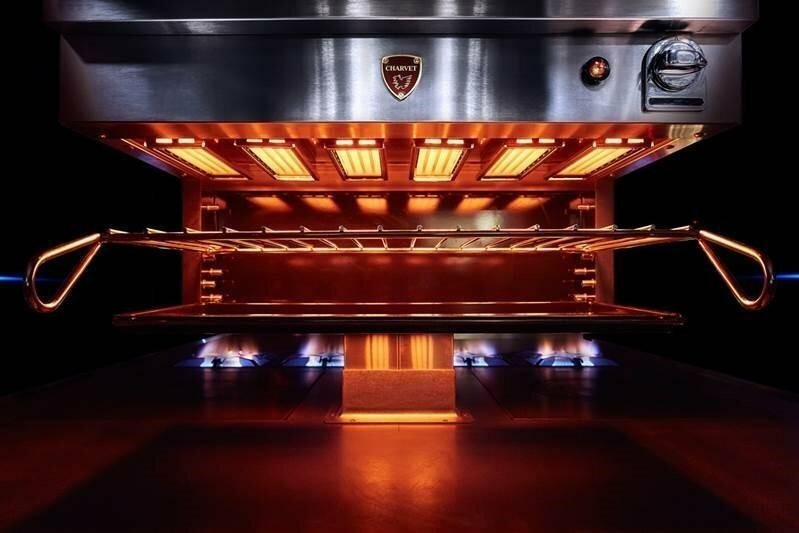 Available in gas or electric (single-phase and three-phase) versions and versatile enough to fulfil many different roles using relatively little space, Salamanders are a common sight in many professional kitchens. Due to their design, Salamanders are usually mounted directly on a wall or shelf so that the cooking is easily monitored at eye level. “I have worked with Charvet in previous kitchens and have always found it to be solid, reliable, provides the cooking power we need and most importantly takes the knocks that inevitably come from being in use 16 hours a day”. 400 º C in just nine seconds — or a massive 570 º C after 15 minutes use. Plate Detection System automatically turns the elements on when a dish is placed under the grill. To find out more about Charvet Salamanders, please email us at sales@charvet.co.uk. Charvet heavy-duty professional cooking ranges are renowned around the world for their quality, performance and reliability -- with cooking suites that any chef and restaurant would be proud to have in their kitchen! Whatever the size or shape of your kitchen, and whether you cater to large numbers or for high-end cuisine, we will plan your range and cooking options around you and your specific needs.